The 6,000 seat London 2012 Velodrome served as an Olympic and Paralympic stadium for track cycling during the 2012 Olympic Games. In legacy use, it will take its place as the centrepiece of the VeloPark, a unique community cycling venue that will provide pleasure and employment to generations of Londoners and visitors from all over the world. The Velodrome is a world-class venue that intelligently answers questions of function, beauty, sustainability, buildability and value. It was delivered by a truly integrated design and construction team who have pursued an agenda of form following function. Inspired by the dynamism and geometry of the track and the engineering rigour of high performance bikes, the team’s design approach followed the desire for lean design throughout: putting the right material in the right places and removing unnecessary 'fat'. Structural steelwork fitted perfectly with this agenda, providing an ultra light, ultra strong roof solution. The external appearance of the Velodrome is the result of 'shrink wrapping' a skin onto a steel skeleton of accommodation within. This both minimises the internal volume that needs to be heated and reduces the surface area (and cost) of the cladding. The roof form was generated by tightly wrapping a steel cable net down onto the seating bowl leading to the distinctive double curved roof form. Similarly, the outer wall was inclined, reflecting how the facade is fixed directly to the back of the upper bowl. This ensemble appears to float over a glazed band splitting the upper and lower tiers - flooding the stadium with natural light and providing dramatic views, connecting events inside with the rest of the Velopark. In receipt of a BREEAM 'Excellent' rating, the Velodrome boasts a number of impressive statistics: 29% recycled content in the building, natural ventilation, exceeding Part L (2006) by 30% and extensive use of natural daylighting to name but a few. The structural system is so efficient that the steel cable net roof is about 35% lighter than the roof of the next best comparable venue in the world. From the outset, a steel cable net structure was the preferred choice for the 13,000m2 roof as it leant itself perfectly to the shape and span, providing a combination of strength and lightness. A curved steel-framed 'bowl' supports the upper seating tiers and is topped by an undulating steel perimeter ring truss, which is used to restrain the roof cables. Both utilise CHS and Catalogue column and beam sections extensively. Unusually for a cable roof, the perimeter ring truss is integral with the steel supporting bowl in order to take advantage of the strength and stiffness of the whole structure. The key advantage of this was that the ring truss became substantially smaller than a self- contained truss member would have been, enabling the re-use of a CHS reclaimed from the Petroleum Institute to form the truss chords. This integrated approach generated embodied carbon savings of approximately 3500 tonnes. 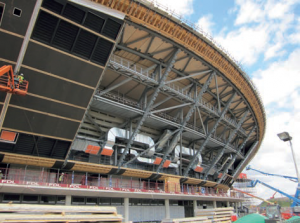 The air-handling units were integrated into the voids formed between the skeletal structure of the steel bowl, while the seating terraces were affixed directly to the inside of the bowl and the building cladding was fixed directly to the outside. This detailed coordination was achieved using 3D modelling software to precisely communicate the positioning of the services, architecture and steelwork in the limited space. Construction issues included design for temporary construction load cases where the main bowl forces were reversed compared to the completed state. To successfully resolve this, structural steel columns and hollow sections were the best choice of material, and included the use of Macalloy post tensioning bars for the primary piers. Due to the design of the cable net the steelwork was erected to a very tight tolerance (± 5mm) 20m up in the air. This required extensive use of 3D surveying tools and a significant use of prefabrication. The design of the steel bowl was developed around prefabrication to improve speed, cut down on waste, and improve quality. The success of using prefabrication is shown in that the only curved elements of the structure became the chord members of the steel ring truss. The steel upper bowl was fabricated and erected as a series of 2D factory prefabricated trusses using off the shelf column sections and designed to be self stable on supporting piers following base bolt tightening. Permanent lateral bracing was used to tie the trusses together with no temporary steelwork required during the erection. The desire to reduce working at height was a significant reason for opting for a cable net roof. The cables were laid out at ground level, clamped together and safety- netted. Only then were the cables jacked up into position: without any temporary works and completed in just three weeks. 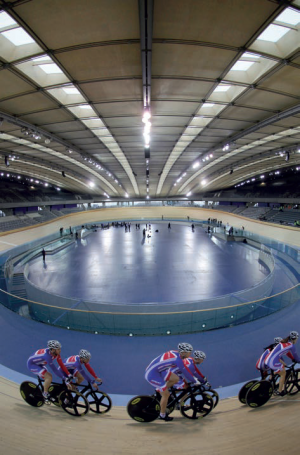 The Velodrome's overriding strength is as an example of the benefits of good collaboration. The early design input of specialists such as the steelwork contractor was critical to the success of this innovative integrated building design. Collaboration ensured the right material was used in the right place, and the use of structural steelwork played a vital role in enabling the initial desire for ultra-lean design to be realised as an iconic sporting venue. The capabilities and versatility of steelwork have been used well in this fine building. Using lean design, this exemplifies an integrated design/construction team mastering a complex brief to produce an exciting and sustainable result. 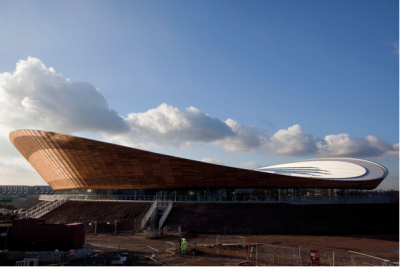 Truly an iconic world-class sporting venue which will endure in its legacy use in the VeloPark.